Earn $5.89 in VIP credit (589 points)What's This? SRAM's WiFli (Wider, Faster, Lighter) philosophy is mainly in regards to the wider gear range offering of their Apex drivetrain. However, with their Apex brakes it means wider tires as they can fit up to a 28mm wide road tire. 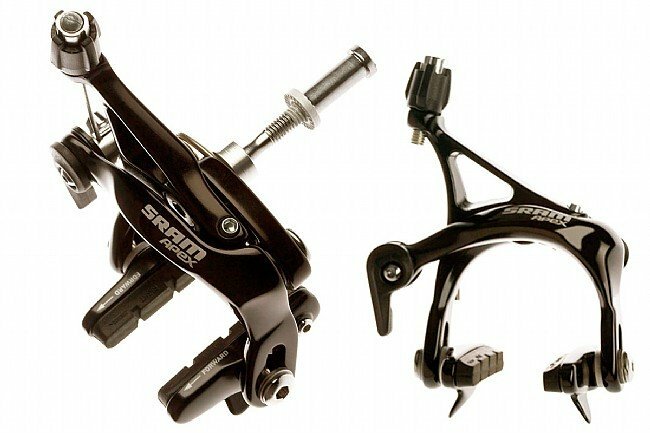 Otherwise, they offer the same braking power and feel of SRAM's other road brake offerings. Forged aluminum construction. Dual pivot design. Cable tension quick release and barrel adjuster. Includes 11mm, 16mm, and 20mm brake fixing bolts for different mount depths. Cartridge pad holders with SwissStop brake pad inserts (uses any Shimano Dura-type insert). Color: Black. 311 grams/set. I bought this to replace the brakes that came on a low end internet bike. Now the bike actually stops. Purchased, to complete the APEX group. made for a smoother stop. The design and materials used in these brakes has made for a more reliable stop. I recommend this easy installing brake set. Replacement brake set for OE brakes. out performs and matches up perfectly with the bike's other Sram Apex components. The braking power and smoothness is now much better. An excellent brake set upgrade. Would recommend.